Where do I use my JML Direct voucher code? Check out the latest deals on NetVoucherCodes for JML. 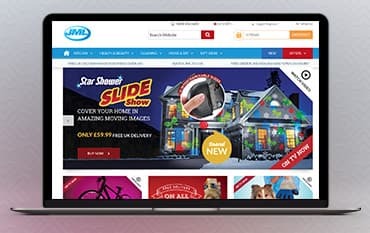 Follow the link through to the JML website and start shopping. Add goods to your basket then review your order when you’re ready. Add your code to the box provided beneath the title ‘Do you have a Promo Code?’. Click ‘Apply To Order’ then proceed to checkout to complete your order. Once upon a time, JML was a small family company that developed through consumer exhibitions with live demonstrations of new and exciting products. Today it's one of the UK's favourite brands and a world leader in the TV home shopping market. Their website offers an extensive range of home and garden accessories, DIY products, Health and beauty products, cleaning equipment and pet supplies, all at great value prices. JML is famous for its great range of kitchen equipment, so if you’re looking at alternative cooking methods, such as halogen cooking then you’ll find halogen ovens placed here. Food preparation in the form of choppers and dicers all help to make life a little easier and with a wide range of blenders and juicers you can whip up a storm in your kitchen. If cooking and cleaning products are not your thing then take a look at the Health & Beauty section, which has a range of skincare and cosmetics or the Home section, where you will find houseware items, DIY products, storage solutions and items for your pets. You won't find many promo codes on offer from JML Direct but what you will find is a fabulous array of products all at fantastic prices. The website also features an offers section, which showcases a range of products at a special irresistible price, offering you some great savings. At NetVoucherCodes, we will always keep you posted on any special money saving offers that are available so you don't miss out on the bargains. JML are stockists of the Rubber Wonderbroom, which is an evolution in sweeping that you can use for both wet and dry situations and it won't wear out, fray, buckle or splay over time, like a traditional nylon brush. It’s waterproof so you can clean it just by rinsing it under the tap or, take off the head and put it into the dishwasher. It will come out looking as good as new. The rubber bristles generate an electro-static effect that attracts small particles to them but, doesn’t hold on to them like a normal brush, just leaves the mess in a line ready to be thrown away. It also features a built-in squeegee along the back edge, with which you can clean windows or tiles. And all this comes at an amazingly affordable price at JML. Hover Ball is the amazing floating football from JML, which allows the kids to play football indoors without breaking your treasured possessions. Shaped like a half-sphere football disc it has a soft foam edge and a super-smooth underside, which that glides effortlessly on most indoor surfaces. It won’t bounce or leave the floor, but stays at ground level, rebounding off skirting boards, furniture and walls, without damage. With the Hoverball rain need never stop play! A Small number of products may require an extra charge due to size. Find more information regarding Delivery costs and Options here. If you wish to make a return, you will receive the usual 30-day money back guarantee on your purchase. you will need to ensure all products are in their correct packaging, instructions and other contents as well as the despatch note. Items must also be unused and in their original condition in order to receive a refund. You will need to contact the Customer Service team in writing via email as soon as possible to notify them of your return. You will then receive a Returns number in which you will need to include on you Despatch note. Find more information regarding Returns & Refunds here. Find JML in a store near you here. Postal Address: JML Customer Services, Unit 1, East Side Port Of Tyne, Tyne Dock South Shields, Tyne & Wear, NE33 5SP. JML has been in business for over 25 years, they supply a range of products for around the home that is unique and innovative in their use and design. By sourcing items from around the world, JML is able to offer top quality products at affordable prices - factor in a JML Promo Codes and you can save even more. They have a Featured Products section, whereby they highlight their personal favourites. The New In range has all the latest additions to the product line and is the place to visit if you’ve heard of some new kitchen gadget.